Fang Marketing-Blog-Which Ads is Facebook Not Approving (Seriously, I’m Asking)? I can’t be the only one seeing these weird ads on Facebook. Actually, I know I’m not; so, maybe I’m just one of the few that cares. … but only headline and body copy because the image is clearly of a beautiful and incredibly limber women performing a high level yoga position. What is this advertiser trying to say here, “We’re going to bend you around like Gumby during the approval process!”? Here’s one for Groupon, who recently got popped for some misleading ad copy; I guess no one thought to ask about the images. I’ve actually tried to find what that building is and where it’s located without any luck, but I can tell you one thing, the Groupon site doesn’t have the answer. Frankly I’d be amazed if they did find 100 things to do in Ventura County, either… Maybe if 99 of them are Six Flags Magic Mountain, they’ll throw in a restaurant or something. These next two are, surprisingly relevant. It happens sometimes. The top one is well targeted, as well as it can be without knowing I’m a competitor, but at least the image matches up with the body copy (although it is a tad small). The bottom ad is really well targeted; it actually pulled out that I like L.A. Noir writer, Walter Mosley, and featured one of his book covers along with an ad for a free audio book. 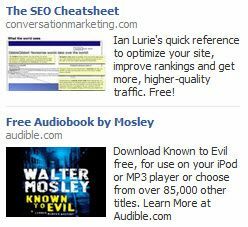 I guess what’s confusing me with Facebook Ads is a lack of consistency with their approvals. I recently ran a test campaign for another advertising blog I own and occasionally write for when I have time, where I pulled images of some popular campaigns and asked people to show if they liked the pitch person with their “likes” (Which actually got the Facebook page for the blog “likes.” Hey, it works, don’t judge.). I had three different ads that targeted different groups and two of them were rejected. All three used images from other company’s ads, so it can’t be a copyright thing (maybe) and the one that was approved had a women in it that some folks find attractive. Just like Google ad copy, the reasons for rejection are way vague, so who knows why the other two didn’t make the cut and one did. Furthermore, why did yoga girl make the cut for a home loan ad when two of my ads did not? You can try and answer me in the comments section, but I doubt it’s more than a guess, so just tell me your own personal disapproval nightmares and we’ll bond in our confusion. Then again, I could always tell them to go for spooky Santa pictures… That clearly seems to be a “like” goldmine for whatever this company sells. If you feel like your social media traffic is stuck and can’t figure out what’s holding you back, give us a shout and we’ll talk about one of our popular Social Media Audits that will put you on the right path to social media marketing greatness. Jeff Ferguson is CEO of Fang Digital Marketing, a strategic consulting firm specializing in Internet marketing, and board member of the Los Angeles chapter of SEMPO, the Search Engine Marketing Professional Organization.